An RR Lyrae star is a short-period, yellow or white giant pulsating variable. RR Lyrae stars belong to Population II and are often found in globular clusters (hence one of their older names – cluster variables) or elsewhere in the galactic halo. They have periods of 0.2 to 2 days, amplitudes of 0.3 to 2 magnitudes, and spectral types of A2 to F6. Some of them have similar light curves to those of Cepheid variables (earning them the now-obsolete name of cluster Cepheids or short-period Cepheids) and, like Cepheids, obey a period-luminosity relation that enables them to serve as reliable distance indicators. RR Lyrae variables, however, are older, less massive, and fainter (with luminosities typical around 45 times that of the Sun) than Cepheids. Two subgroups are recognized: RRAB, which pulsate in the fundamental mode, and RRC, which pulsate in the first overtone. 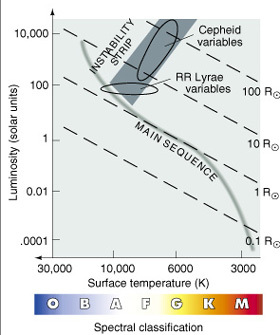 Type RRAB shows an asymmetric light curve, with a steep rise and a more gradual decline, while type RRC varies roughly sinusoidally and with an amplitude of less than 0.8 magnitude. The presence of scatter and large amplitude variations in the light curves are often the signature of double-mode pulsation and the Blazhko effect in some of these variables.